Careers will be changed tonight thanks to the annual WWE Superstar Shake-up. WrestleMania 35 is in the history books but the fallout from the Showcase of the Immortals is still being felt. With the Universal title, finally, once again a full-time fixture of the red brand, the RAW and SmackDown Women's titles on Becky Lynch and Kofi Kingston finally realising his dream, this year's 'Mania seemed to have been one of closure. But tonight, things are going to be shaken up once more as night one of the WWE Superstar Shake-up comes around. 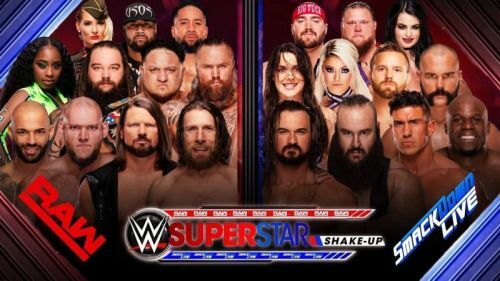 The shakeup, which will continue on SmackDown Live tomorrow night, happens just once a year, but the impact of it can be felt for years to come. And as well as the big shakeup, there's plenty more to get hyped for for tonight's epic three-hour blockbuster. Here are 5 things you need to know before tonight's WWE Monday Night RAW. Evans attacked The Man last week on both Monday Night RAW and SmackDown Live. At WrestleMania 35, Becky Lynch, Charlotte Flair and Ronda Rousey made history by taking part in the first ever women's main event in the show's history. A hotly contested bout, it was The Man who emerged the victor, capturing both the RAW and SmackDown Women's titles. But like so many champions before her, Lynch is now seeing that winning a title is far easier than keeping it. Already she has challengers knocking on her door, most prominently Lacey Evans, who brawled with the champ not once, but twice last week. What will the Southern Belle of WWE have in-store for the champ tonight? Whatever the former Marine has planned, expect the always confident champion to have an answer for her and her antics tonight on Monday Night RAW.